Spain's Lionel Messi and Cristiano Ronaldo were out of the last 16 of the World Cup on Saturday. She also focused on confronting La Roja with his Russian home side in the Round of 16. The most prominent headlines in the Spanish newspapers today are as follows. "We believe in you before we face the players today in the Round of 16," Marca said in a statement. Argentina and Portugal were out of the World Cup. "Messi and Cristiano Ronaldo are out of the World Cup after losing to France and Uruguay," she said. "Kélien Mbabé is a super star at the World Cup, after the Paris Saint Germain starred against Argentina yesterday." 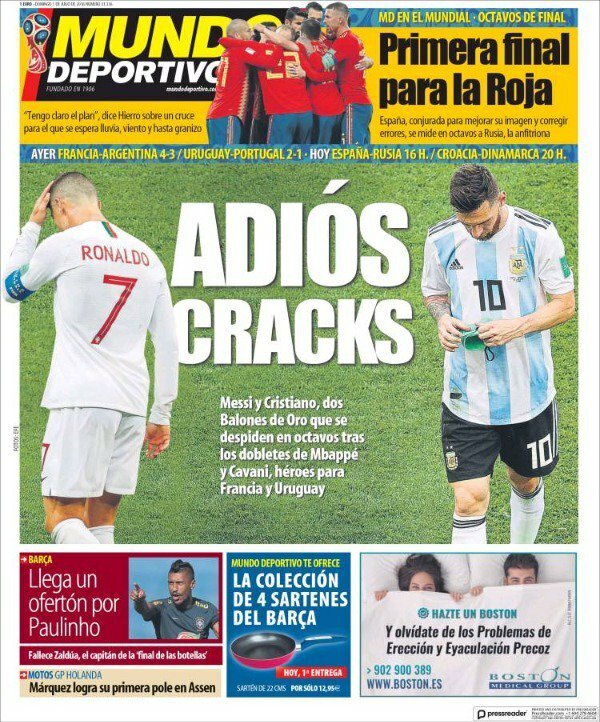 Lionel Messi and Cristiano Ronaldo are the co-stars of the Mundo Deportivo newspaper today, which said: "Star farewell." "Messi and Cristiano Ronaldo will be out of the 16th round of the World Cup after two doubles from Mbabi and Cavani." 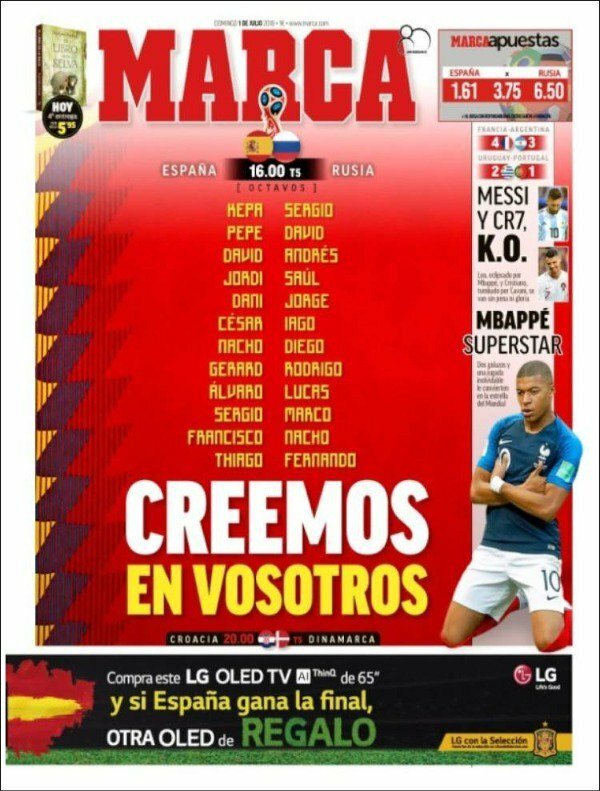 At the top, the newspaper pointed out: "the first final of the Spanish team against his Russian counterpart today in the role of the 16 of the World Cup." 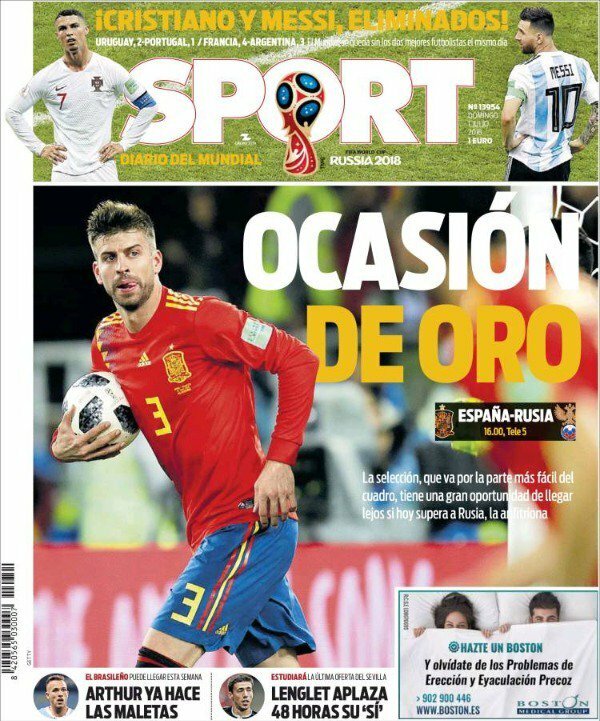 Gerrard Pique, defender of Barcelona and the Spanish team, issued the cover of the newspaper "Sport" on Sunday, which said: "Golden occasion." "The Spanish team has the opportunity to skip the role of the 16th day at the expense of the Russian team the owner of the land." 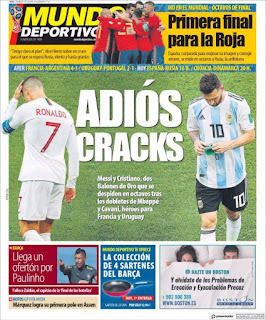 At the top, she said: "Messi and Cristiano Ronaldo are farewell to the World Cup after the loss of France and Uruguay." "Arthur is already packing his bags from Gremio," the paper said. The front page of the Super Deporte, close to Valencia, was a picture of Diego Costa and called "a decisive hour for La Rioja." 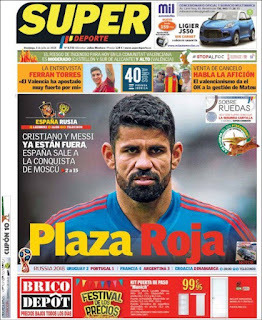 The newspaper added: "Messi and Cristiano are already outside the World Cup and Spain is seeking to invade Moscow."